Television is so 20th century! The advent of Internet video has opened entirely new channels for send-up acts such as God's Pottery and the Gregory Brothers, each of which offers its own take on the music, media, and mores of our day. 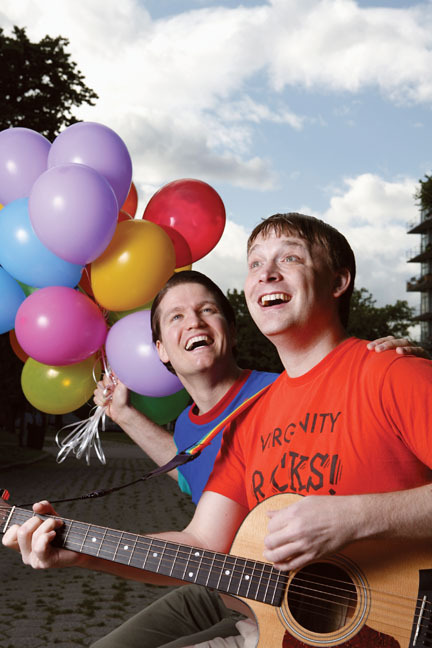 Wilson Hall ’95 and Krister Johnson ’95 spread the word as a religious comic singing duo. Wilson Hall (left) and Krister Johnson made it to the finals of the 2008 season of Last Comic Standing with their ingenuous Christian characters, Jeremiah Smallchild and Gideon Lamb. Their book, What Would God's Pottery Do? The Ultimate Guide to Surviving Your Teens and/or Being Successful! was published in September. Gideon starts strumming the guitar and bobbing his head as Jeremiah launches into one of the pair’s most popular songs, “The Pants Come Off When the Ring Goes On,” an anthem about a nubile “Christian princess,” her hot quarterback boyfriend, and their decision to wait until their wedding night to jump into bed. But far, far offstage, Jeremiah is really Wilson Hall ’95 and Gideon is Krister Johnson ’95—information they don’t let slip very often, and never while performing. As God’s Pottery, they’ve toured the United States and performed abroad, and in summer 2008 they appeared on NBC’s Last Comic Standing. This September, they published their first book, What Would God’s Pottery Do? The Ultimate Guide to Surviving Your Teens and/or Being Successful! Hall and Johnson inhabit their characters so thoroughly that audiences aren’t always completely sure how much is an act. On their God’s Pottery blog, reactions to their elimination from Last Comic Standing—and there were plenty—represented a mix of “haters” (“You were not even remotely funny.”); Christians who either enjoy them (“We loved that you were able to bring God’s truth to so many …”) or find them insulting (“I, for one, am tired of people mocking my God for a laugh.”); people who suspect that something’s up (“Are you guys really Christian?”); and flat-out fans (“I am completely bummed out that you got eliminated tonight … especially when you killed it!!”). About 10 years ago, Johnson and Hall, aspiring actors who had regular office jobs in New York, started exploring different characters and entertaining ideas. “Most of it was absolutely for our own amusement,” says Johnson. “There were certain one-off character things we would do at these small comedy shows, and we started drifting toward the musical aspect of coming up with something funny. We started coming up with fake band names and fake band genres.” Conservation Conversation, for example, was conceived as an eco-friendly two-man drumming circle, and 3way (pronounced “Freeway”) was a raunchy hip-hop group with unprintable song titles. They also created a pair of characters for comedy shows in New York who weren’t Christian and weren’t Jeremiah and Gideon “but were pretty unctuous in the same way,” says Johnson. “It felt like we had something,” says Hall. 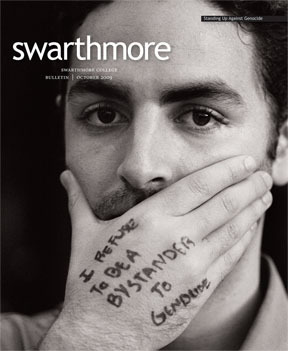 Krister Johnson ’95 and Wilson Hall ’95 recently visited the Swarthmore College campus. Wingate got them a gig recording their songs for an episode of the British television comedy series The World Stands Up. She also encouraged them to flesh out their material and their characters to sustain an hour-long act, which they took to the Edinburgh Festival Fringe, the world’s largest arts festival, in the summer of 2006. Their originality scored points with the international audience, and they were nominated for the coveted Best Newcomer award. “In the shows, we have funny lines in songs that are punch lines, but it’s really a slow burn, watching the relationship between the characters,” says Johnson. On stage, Jeremiah has appointed himself Gideon’s older brother or father figure, and Gideon is generally happy with this arrangement, though he will occasionally rebel and challenge Jeremiah’s authority. Watch out, Katie Couric. 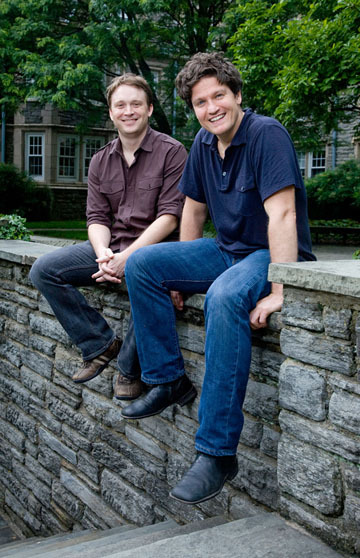 The Gregory Brothers—including Evan ’01 and Andrew ’04—make mash-up music from your news. Andrew (standing, left) and Evan Gregory (seated, with his wife Sarah) are the Swarthmore half of the Gregory Brothers. Each of the Brooklyn-based “brothers”—including youngest bro’ Michael, with glasses—plays in at least one other band. All are bemused by the success of their side project, Auto-Tune the News. Since its release in 1997, Auto-Tune, audio processing software that is used to correct pitch, has revolutionized the music industry. The tool’s primary use—in studios and on stage—has been as a crutch, to easily and discreetly correct a singer’s off-key notes. Quickly, though, artists began to recognize Auto-Tune’s potential as an instrument in its own right. Cher’s 1998 hit “Believe” widely introduced the distinctive electronica-inflicted Auto-Tunes warble—now a staple of many pop and hip-hop songs—to a wide audience. Recently, the technique even has crept into evening news broadcasts and talk shows, adding a melodious timbre to the voices of Katie Couric and Sean Hannity, among others—although not in their work as originally broadcast. Rather, it’s the tricky—and often hilarious—digital handiwork of the Gregory Brothers, a Brooklyn-based folk and soul quartet that includes Evan Gregory ’01 and Andrew Gregory ’04. Their video mash-ups, Auto-Tune the News, have become Internet sensations—and must be experienced to be completely understood. Michael Gregory: You got to do it like this. Shorty—ready, set, go. Michael (interrupting): What you trying to say about Iowa? Marcus: Not an East Coast state. Michael: (holding up three fingers in a common hip-hop salute to the East Coast): East Coast! Marcus (picking up the beat): Not a Left Coast state. The skit continues with other snappy duets, including one pairing Sean Hannity and an angry gorilla (played by a Gregory in a gorilla suit) and another with Andrew Gregory and Katie Couric harmonizing a chorus—“very thin ice/very thin ice”—as Couric reports on global warming. The Gregory Brothers’ fourth member, Evan’s wife Sarah, lends her stirring voice to other installments of the Auto-Tune the News series. The videos succeed on two levels. They’re carried musically by the Gregory Brothers’ original compositions, witty lyrics, and precise vocal arrangements. And, as political parody, they skewer the increasing vapidity of both pop music and television news. The Gregory brothers grew up in Radford, Va.—not far from Washington, D.C. Their parents, both college professors, “were musical; they played piano and guitar, but they weren’t pros,” says Andrew. Evan, the oldest of the brothers, was a music major at Swarthmore and a pianist. “I wasn’t involved in the band scene at all,” he says. “I was more focused on the classical stuff, and that training was invaluable.” He was, however, in the a cappella group Sixteen Feet, which Andrew also joined when he came to Swarthmore. 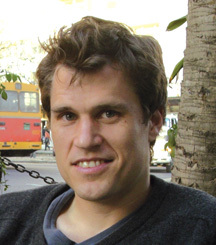 In college, Andrew taught himself guitar and played in a two-man band alongside Joe Raciti ’05. A few years later, Michael also auditioned for the show, consciously trying to make it onto the blooper roll—a compilation of the worst performances. He succeeded, and in a clip from Season 7, you can see Michael, dressed like a nerdy extra from an 80s geeks-versus-jocks film, earnestly belting out “I Wanna Love You” by the R&B singer Akon. The judges were aghast. Ultimately, Evan’s younger brothers joined him in Williamsburg and found work as SAT-prep tutors. But music is largely the focus of their lives, and each plays in several bands. In July, I saw The Gregory Brothers perform at a club in downtown Manhattan, headlining a show that also featured Sarah and the Stanleys, Sarah Gregory’s band. Their music is very different from their Auto-Tune fare. Though there’s the occasional comic verse, the band fits comfortably in the soul-folk ensemble tradition. Recently, the hip-hop artist Jay-Z released a song called “D.O.A. (Death of Auto-Tune),” in which he lashed out at fellow hip-hop artists who relied on the audio processor. “I just think in hip-hop, when a trend becomes a gimmick, it’s time to move on,” said the Brooklyn-born superstar, citing a Wendy’s hamburger commercial that satirized the Auto-Tune epidemic. Take it easy, Jay-Z. Auto-Tune likely is too convenient a tool to give up. But perhaps listeners will tire of its over-aggressive use. If so, the Gregory Brothers’ musical ribbing may be remembered among the era’s most notable accomplishments. 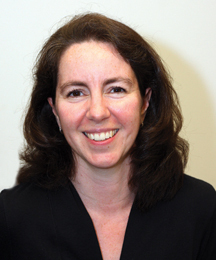 Sara Shay ’92 is a freelance writer and editor in the Philadelphia area whose recent clients include MIT’s Technology Review, the Center for Reproductive Rights, the Coalition for the International Criminal Court, and the parenting Web site BabyZone.com. She has a master’s degree in journalism from Northwestern University. “Altar Egos” is her first article for the Bulletin..
Paul Wachter is a writer in New York with a silky smooth voice in no need of Auto-Tuning. I LOVE THE GREGORY BROTHERS. ! they're AMAZING!